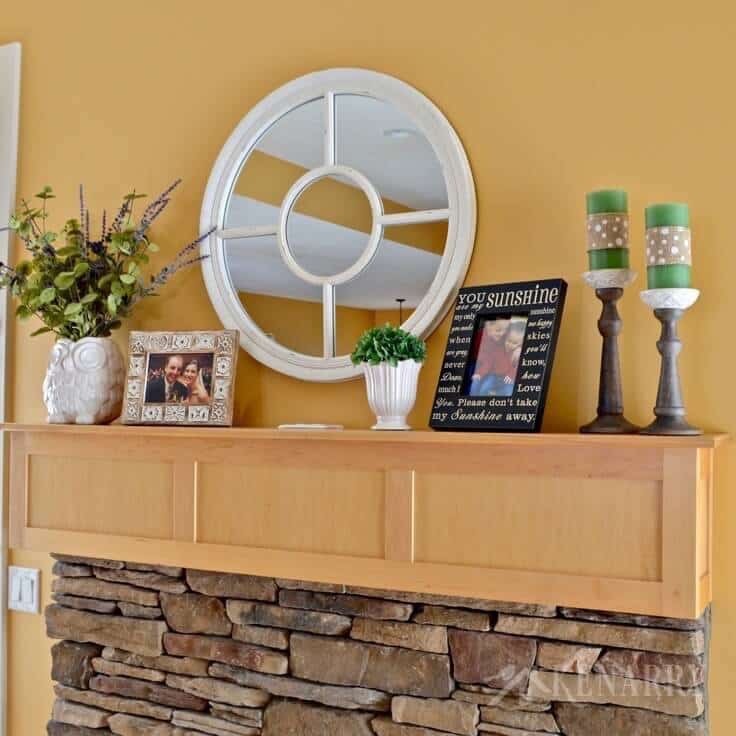 You’ll love these spring mantel decor ideas to update a fireplace with refreshing spring green and purple home accents! Give your fireplace a seasonal makeover with these Spring Mantel Decor Ideas using refreshing green and purple accents, white vases, eucalyptus and candlesticks. 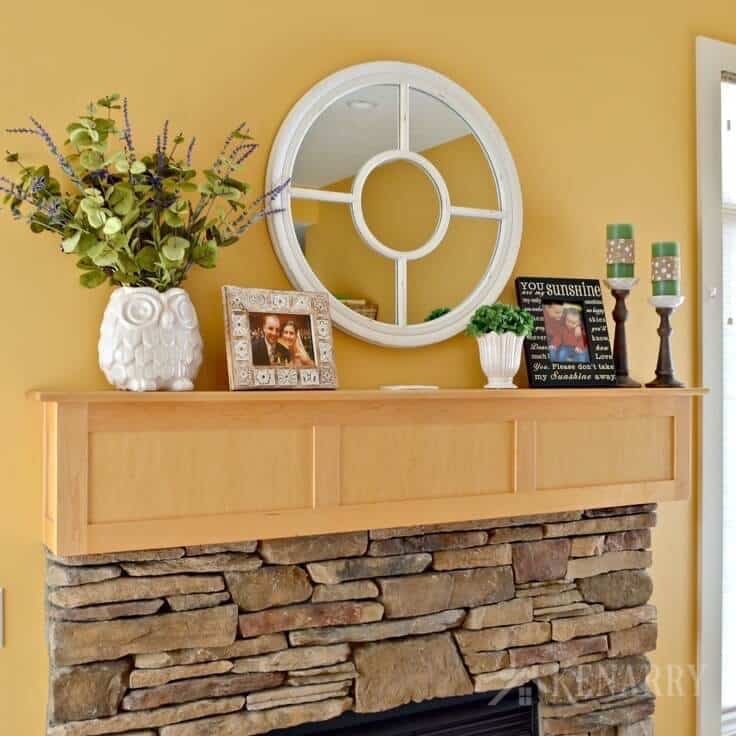 For our winter mantel decor, we created a dramatic change by replacing the art above the fireplace with a white framed mirror, got new candle holders, a large white owl vase, a small vase and changed one of the picture frames. We intentionally chose some basic white pieces that could be used year-round and then accented with seasonal colors and foilage. For the winter mantel decor, we used rustic red, bare branches with red berries and red hydrangeas. 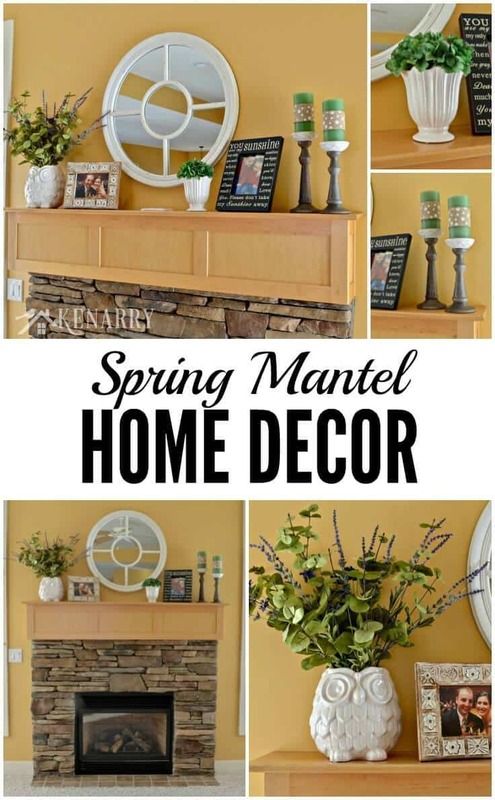 The color choice for our spring mantel decor was an easy one for me. What says spring more than the color green? It’s fresh and reminds us of new life as plants begin to bud, flowers start to blossom and grass begins to turn green after a long winter’s nap. I just knew it was the color to focus on with our spring mantel decor this year. I also threw in a little bit of purple since lilacs bloom this time of year and Easter occurs in the spring. We typically spend Easter with my Aunt Ronda who loves the color purple so that’s likely why I associate purple with spring. 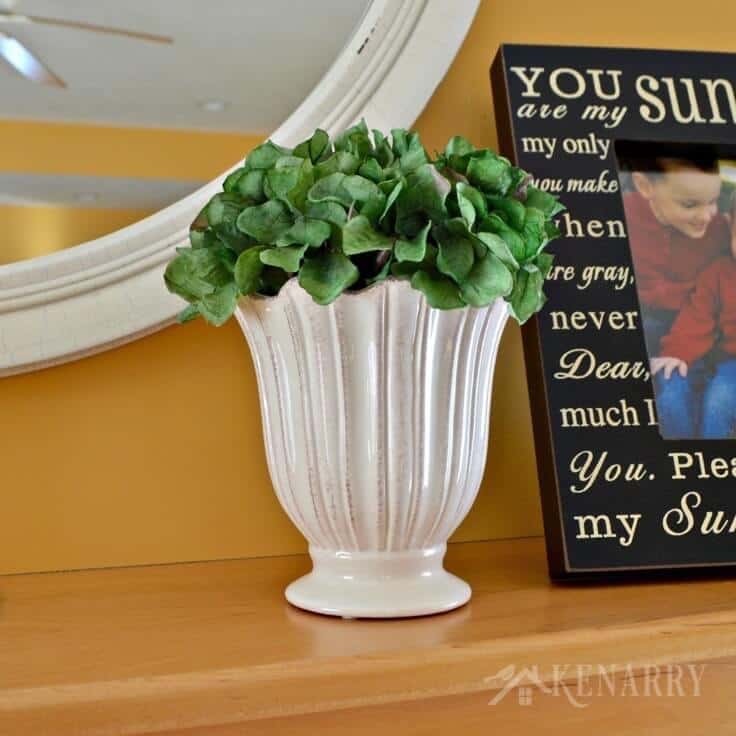 Using basic white decorations made it really easy to change our spring mantel decor when the new season rolled around. Once I determined a color scheme, I just had to swap out the accent pieces. First, I replaced the bare branches in the owl vase from winter, with an arrangement of artificial green eucalyptus, lavender and some deep purple flowers. Next, I swapped the red hydrangeas in the small white vase with green hydrangeas. The artificial flowers I choose actually have just a little bit of purple on the tips of the petals so they tie in nicely with the eucalyptus arrangement in the owl vase. Last, but not least I traded the rustic red candles with bright green ones. The green candles looked a little plain as is on the candle holders so I hot glued some thick burlap ribbon around the center of each one. The burlap ribbon was leftover from a denim and burlap wreath I made for our cottage. It has white polka dots of varying sizes on it which gives the candles a fun whimsical appearance and coordinates nicely with the basic white decor pieces. 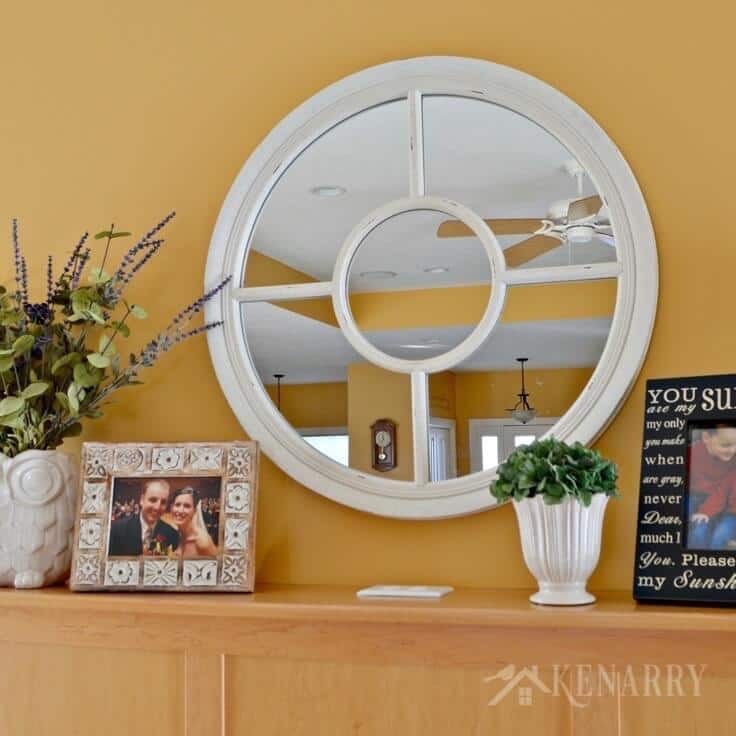 I kept the large mirror and the picture frames since they’re neutral and can really coordinate well with any color. In the future, I’m thinking about hanging a small green wreath on the front of the mirror if I can find one I like. I also think a small ceramic white rabbit or two (or three… you know how rabbits multiply) would add a little something to the spring mantel decor. Don’t you? I know I’ve seen some in home decor stores so I just need to keep my eyes peeled for a good deal. Rabbits would give the mantel a spring look without it being too tied to Easter. Now the big question is: what color scheme and additions or changes do I make to the mantel decor for summer? Please comment below and share your thoughts. We’re always looking for new ideas. Right now I’m really inspired by the embedded sea glass candles the O’Neil Sisters from Running With Sisters shared as their Kenarry Creative Team post this month. I could go with turquoise blue for the pillar candles or maybe something with shells? I’m thinking either ferns or tall beach grass in the owl. I also really loved the bright hot pink hydrangeas I saw at the store when I was buying the green ones for spring. I’m not sure if I can get hot pink to pass in a house with four guys (including the dog!) though. 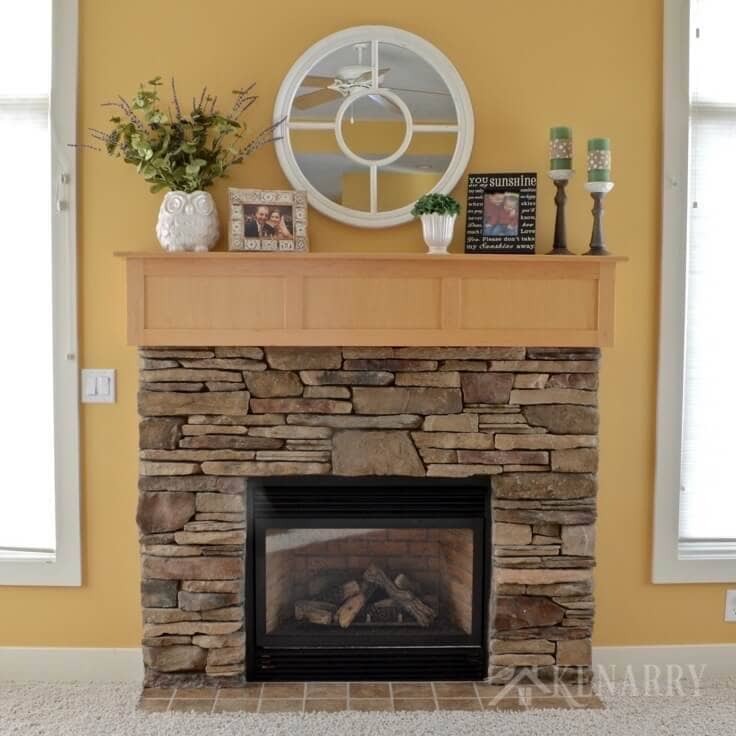 We shopped online to find similar products like we used for our spring mantel decor, in case you wanted to get this same look above your fireplace. As you shop online, search for terms like “antique white”, “distressed white”, “rustic” and “shabby chic” to find home decor like this. Home Decorator’s Collection – The wide owl vase is similar in size to ours. 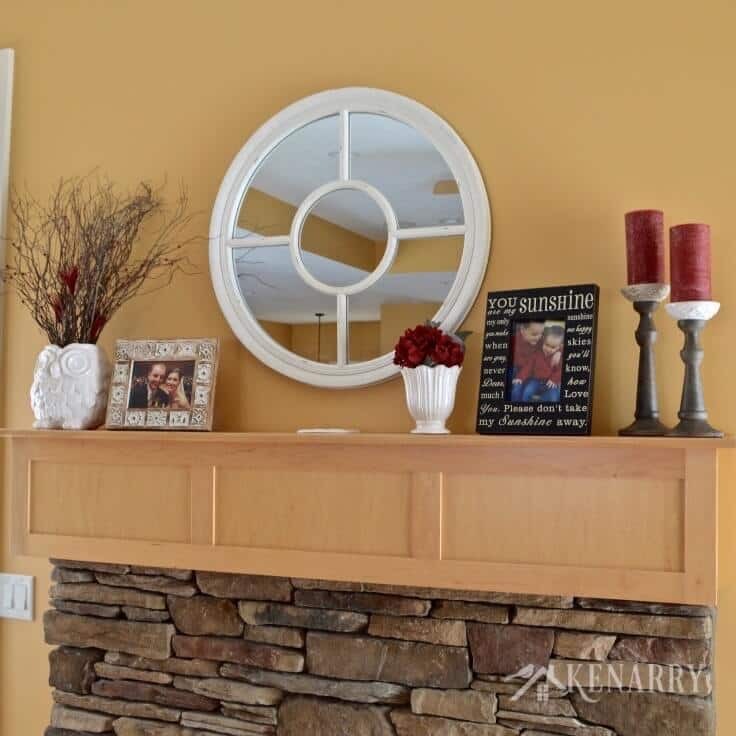 Supreme Sadie Wooden Mirror – This one is different, but has a white washed look that would be great for your spring mantel decor. I think this short Water Pitcher Flower Vase would also be pretty or this Rustic White Display Bowl Vase. This Wood Lace Doily Pattern frame with a bird is totally different, but I think the white lace pattern is beautiful and would be great winter mantel decor. Sage Green Candles – If you prefer to use LED candles, I think these light green LED candles or these sage green LED candles look like mine and get good reviews. 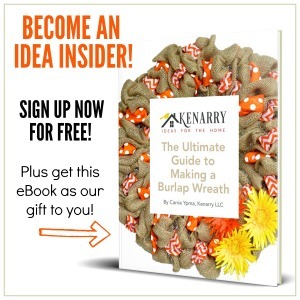 White Polka Dot Burlap Ribbon – I used the kind with a wired edge to help hold it in place and then secured it using my hot glue gun. Artificial Lavender – I got ours locally at Hobby Lobby, but these lavender flowers on Amazon look similar. Spring Green Eucalyptus Leaf Bush – I also got ours at Hobby Lobby. Amazon does sell artificial eucalyptus, but it’s difficult to tell quality level from the photos and most have not been rated by other customers yet. Green Hydrangea Floral Pick – You could also use one of these light green artificial hydrangeas. 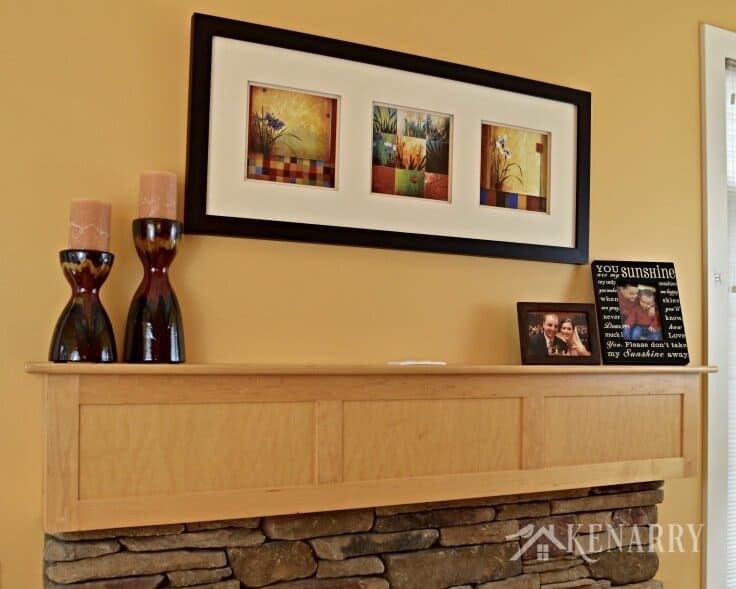 Do you change the mantel decor above your fireplace seasonally? What elements do you include or swap out? Please comment below and share. 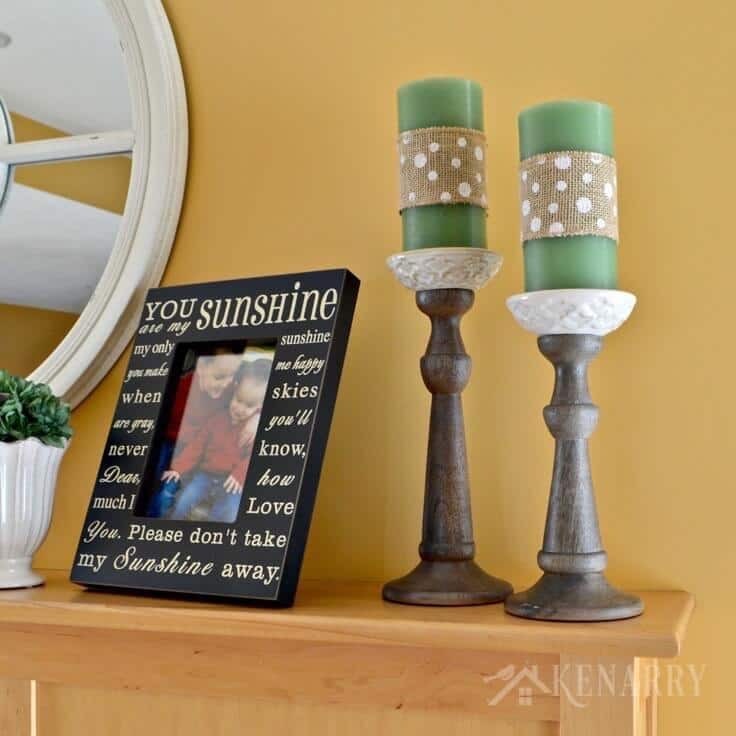 We’re always looking for new ideas especially as we consider changing out our mantel decor for summer and fall later this year.